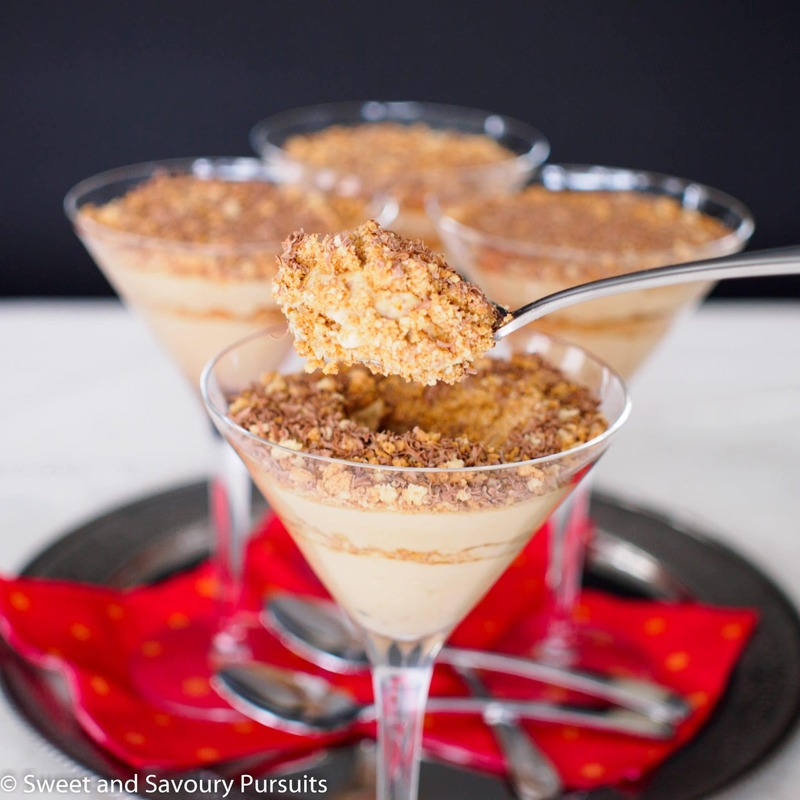 These delicious Mascarpone Espresso Cream and Amaretti Parfaits taste like coffee flavoured cheesecake but take very little time and work to prepare! Growing up, one of my favourite cakes was a vanilla cake with a coffee flavoured icing that my mother would make for special occasions. This Mascarpone Espresso Cream and Amaretti Parfaits reminds me of that cake. Though this mascarpone parfait dessert is more similar to cheesecake in texture, it’s an easy and quick solution to my cravings for that coffee flavoured cake. This no-bake mascarpone dessert is great on those hot days when you don’t want to turn the oven on or when you’re oven is being used to prepare a big meal and there is no time to bake anything for dessert. Though there is no cake portion to this dessert, the crushed amaretti cookies are a great substitute. Depending on how much time there is between when you prepare this dessert and the time you serve it, the cookies will absorb the humidity from the mascarpone and heavy cream and soften. I personally like to make sure there is still some crunch to this dessert, so I leave some bigger amaretti bits in there and make it no earlier than two to three hours before serving. 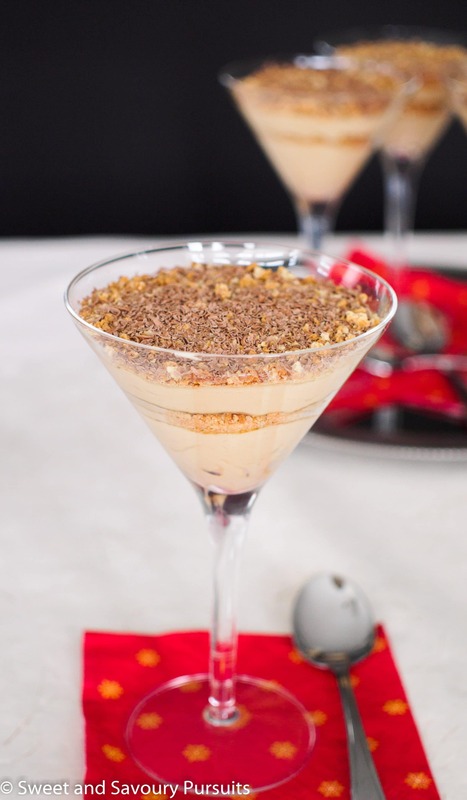 These Mascarpone Espresso Cream and Amaretti Parfaits are easy to make, require few ingredients and can be prepared very quickly. If you love coffee then you will want to try this delicious dessert! You may also want to take a look at this healthy Coffee Smoothie recipe, it’s perfect for getting the day started right! Dissolve 1 tablespoon of instant espresso in 2 tablespoons of boiled water, refrigerate to cool. Place amaretti cookies in a sturdy zip top bag and using a rolling pin, or tool of your choice, crush amaretti cookies, leaving some larger pieces. Set aside. Grate the dark chocolate with a grater and set aside. In the bowl of your stand mixer, whip the mascarpone cheese, heavy cream, coffee and vanilla. Whip until soft peaks begin to form and then slowly add the icing sugar. Whip until stiff peaks form. Spoon half of the mascarpone cream evenly among the glasses. Sprinkle half the crushed amaretti cookies over the mascarpone cream and repeat layers once more. Top each serving with a sprinkling of grated chocolate. This will make 4 to 6 servings depending on the size of your glasses. This recipe seems delicious! 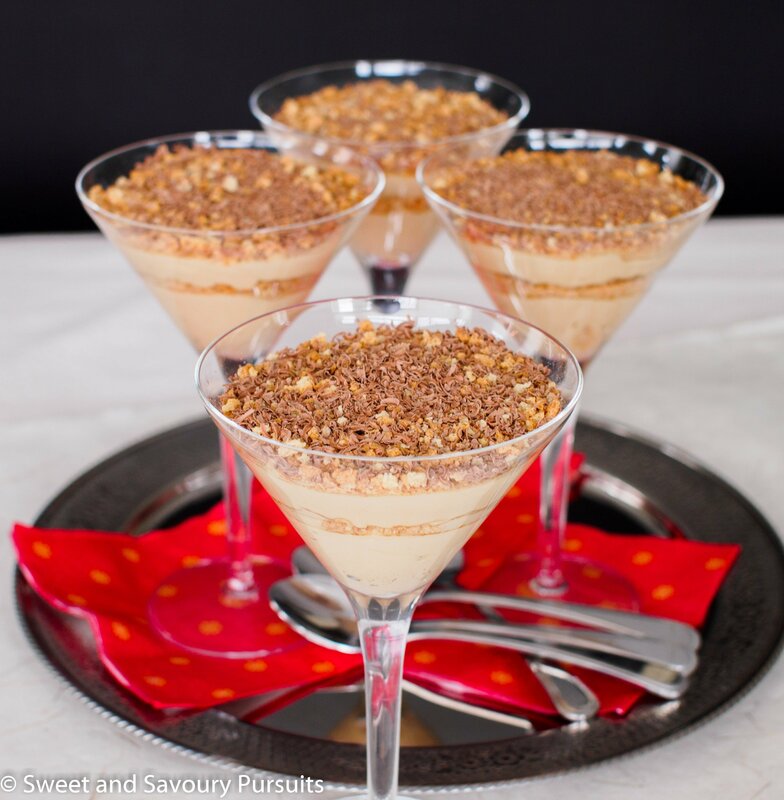 I am a big fan of coffee desserts,i will try it try it out for sure!! Thanks! I really think you would like this one. It’s delicious! Had some guests over for dinner yesterday and made this for dessert for them, it was great! I’m so happy to know that you enjoyed it. Thanks! These really look great. Can’t wait to try them. Thanks Alex! If you decide to make it I would love to know how you liked this recipe.